A view north along the Sound of Islay from the ferry leaving Port Askaig. A small fishing boat is returning to Port Askaig while a lifeboat is moored at Caol Ila. 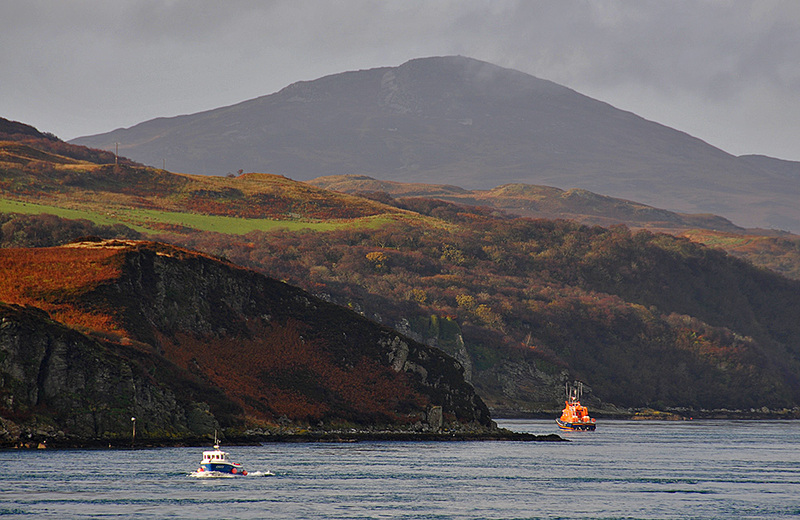 If memory serves me right this wasn’t the Islay lifeboat, but another visiting lifeboat. In the background Sgarbh Breac (364m), the highest hill in the north of Islay. This entry was posted in Cloudy Weather, Landscape, Repost, Sunny Weather and tagged Caol Ila, Fishing Boat, Islay, lifeboat, Port Askaig, Sgarbh Breac, Sound of Islay by Armin Grewe. Bookmark the permalink.